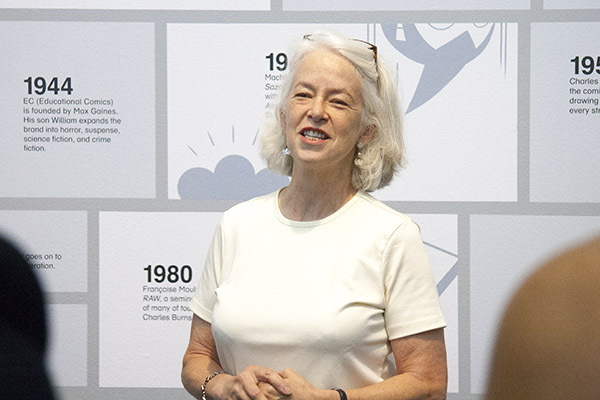 Lynne Warren, curator at the MCA, photographed while giving a gallery talk in August 2013. We had a conversation about her long tenure at the MCA, beginning as a secretarial assistant in 1977. She curated her first exhibition in 1981 and spoke about how her projects are either large and encyclopedic or very small and specific. She also mentioned the MCA's early intention of being a Kunsthalle - an art center that only exhibits - and then became a collecting institution. Lynne Warren was a great help in filling in gaps in my research and illuminating aspects of the MCA over the past thirty years. Presentation of this brochure is courtesy of the MCA Chicago Library & Archives. This brochure was produced during Lynne Warren's second year as a curator. The schematic shows the museum after its first expansion at the Ontario Street location in 1982. It would soon outgrow this space. 7 Artists: a look at some recent graduates of Chicago art schools. Exploration of emerging representationalism and a crude style through an examination of contemporary art educational practices, accompanied by illustrated catalogue with essay. Selected Works by John Cage and Other Composers. Scores & visual art works by contemporary composers held in conjunction with New Music America Festival. (traveled 1983‑85 to the Aspen Center for the Visual Arts, Colorado; Hood Museum of Art, Dartmouth College, Hanover, New Hampshire; Lowe Art Museum, Coral Gables, Florida; Midland Art Center, Midland, Michigan; Huntsville Art Museum, Alabama; Montgomery Art Museum, Alabama). Theme exhibition dealing with the re‑emergence of figurative imagery in the work of 18 contemporary American artists, accompanied by an illustrated catalogue with essay. Thirty‑year retrospective of this seminal figure in contemporary photography, accompanied by fully‑illustrated exhibition catalogue with general essay and entries on individual series of works. The Ronco Show at Randolph Street Gallery, Chicago. Theme exhibition featuring the convenience gadgets of the “king of late‑night TV advertising,” the Ronco Corporation, that explored how objects and ideas enter American culture. Alternative Spaces: A History in Chicago. Additions to exhibition organized by the Mendel Art Gallery, Saskatoon, Canada, accompanied by an illustrated gallery sheet with essay. Phil Berkman at Randolph Street Gallery, Chicago. 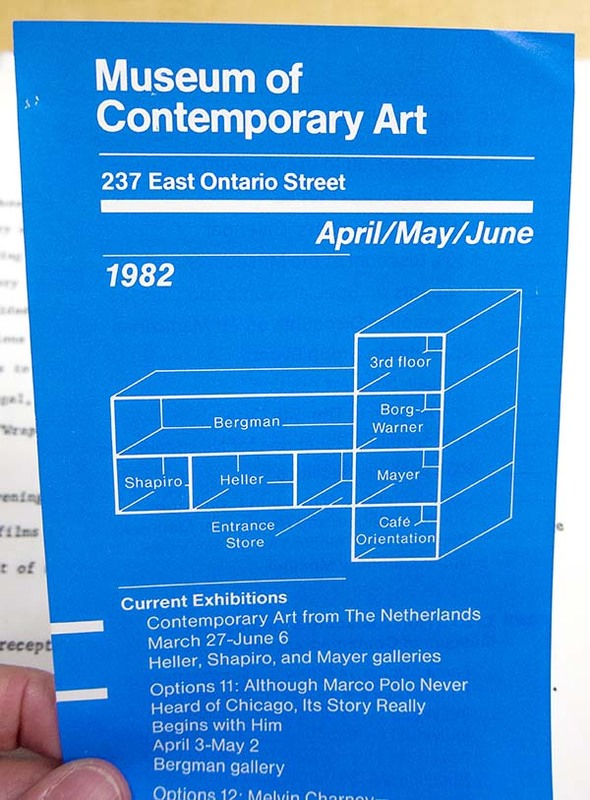 One‑person exhibition of works 1983‑1985. Paul Rosin, Ken Warneke, Jin Soo Kim, Jo Anne Carson. Four simultaneous one‑person exhibitions by emerging Chicago artists, accompanied by four illustrated brochures with essays. (traveled to the Museum of Contemporary Art, Los Angeles; the Fort Worth Art Museum, Texas; The Brooklyn Museum, New York). First major museum presentation of New York painter's work, accompanied by book published by Harry N. Abrams. First solo museum showing of New York‑based painter, accompanied by illustrated brochure with essay. Four‑person exhibition of artists who use media presentations to deal with issues of society and morality, accompanied by small illustrated catalogue with essay. A New Generation from SAIC. Individual installations and projects by 16 area and New York artists recently graduated from Chicago's School of the Art Institute, including Elizabeth Newman, David Klamen, and Tony Tasset, accompanied by illustrated catalogue with essays on each artist. (traveled to the Contemporary Arts Center, Cincinnati and the Contemporary Arts Museum, Houston). First one‑person museum exhibition of New York artist who works in kinetic tableaux, accompanied by a fully illustrated color catalogue with essay. Chicago Artists in the European Tradition. Ten Chicago-area artists, accompanied by color catalogue with essay. Toward the Future: Contemporary Art in Context. Major exhibition of MCA permanent collection. One‑person exhibition of abstract sculptor, accompanied by color brochure with essay. Realism, Figurative Painting, and the Chicago Viewpoint. Solo exhibition of New York‑based painter, accompanied by a 48‑page, color catalogue with essay. Selections from the Permanent Collection: Alexander Calder from the Ruth and Leonard J. Horwich Family. Accompanied by color catalogue with essay. Permanent Collection Focus:Conceptualism-Postcon­ceptualism: The 1960s to the 1990s. Selections from the Permanent Collec­tion: Conceptual Photography from the Gerald S. Elliott Collection. Exhibition of a group of gifts from legendary collector, accompanied by full-color brochure with essay. Conceptual-environmental project by Chicago-based artist accompanied by color brochure with brief essay. Jim Lutes: The Development of Style. Monographic exhibition of Chicago-based painter accompanied by color catalogue with essay. Major historical exhibition accompanied by book of the same title published by Thames and Hudson, London and New York. 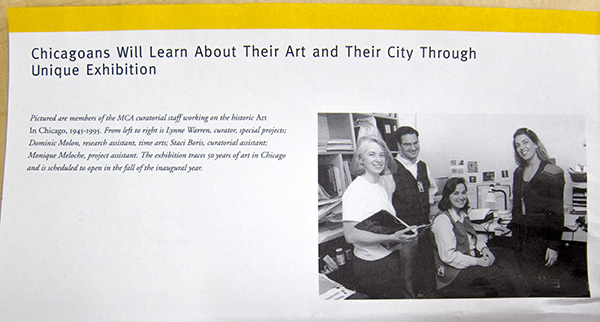 This 1994 MCA promotional brochure shows Lynne Warren and others, while preparing for the exhibition, Art in Chicago, 1945-1995. Left to right: Lynne Warren, curator, special projects; Dominic Molon, research assistant, time arts; Staci Boris, curatorial assistant; Monique Meloche, project assistant. Miroslaw Rogala: Divided We Speak. New interactive sound and media installation by renowned media artist. One-person exhibition by Chicago-based conceptual artist, accompanied by a catalogue. Robert Heinecken: Photographist, a 35-year retrospective. Traveled to the Los Angeles County Museum of Art. Accompanied by a monograph, Robert Heinecken: Photographist. Exhibition of new body of work by established Chicago painter, accompanied by catalogue. (traveled to numerous Illinois and national venues). Premiere of suite of 24 color etchings. Accompanied by catalogue with essay and centerpiece of annual MCA Family Day. Wanderings of the Mind’s Eye: Photographs by Illinois Artists from the MCA Collection. This exhibition presents work by eleven Illinois-based artists from 1930 to the present that evokes reveries, dreams, or other workings of the subconscious. Multiformity: Multiples from the MCA Collection. Mid-career review accompanied by catalogue with essay and accompanying project on MCA plaza, Standard Kiosk (Chicago). Exhibition of works from MCA collection showing generation that emerged in Chicago in the mid-1980s. UBS 12 × 12: New Artists/New Work: Stan Shellabarger. First solo museum exhibition for popular alternative cartoonist accompanied by cartoonist-designed gallery guide with short essay. Drawn Into the World: Works from the MCA Collection with selected loans. Collection exhibition exploring contemporary drawing. UBS 12 × 12: New Artists/New Work: Jason Lazarus. UBS 12 × 12: New Artists/New Work: Lora Fosberg. 40th Anniversary Exhibition that traced the history of the MCA in artworks, photographs, news clippings, artist correspondence and other archival materials. In conjunction with major exhibition Jeff Koons; presented Chicago-based artists from MCA’s collection that had been admired by and influenced Koons. Alexander Calder: Form, Balance, Joy. Major traveling exhibition that examines Calder’s influence on contemporary sculptors. Includes work of seven rising international artists. Accompanied by major publication of the same title. Jim Nutt: Coming Into Character. Major exhibition accompanied by artist-designed monograph. In-depth examination of pioneering artists’ books artist drawn from MCA collection. Exhibition drawn from MCA collection and archives celebrating 100th anniversary of Cage’s birth and examining the many intersections of this acclaimed figure with MCA Chicago. Exhibition drawn from MCA collection featuring films and charcoal drawings for this South African artist’s acclaimed films. Modern Cartoonist: The Art of Daniel Clowes. MCA DNA: Chicago Conceptual Abstraction, 1985–1996. Explores group of conceptually informed Chicago based artists who emerged around Randolph Street Gallery; includes Tony Tasset, Jeanne Dunning, Inigo Manglano-Ovalle, among others.